Add canola oil to pan and sauté the minced garlic and shallots for approximately 5 minutes. Cube sweet potato and add black beans, corn, tomatoes to crock pot along with chicken stock and lime juice. Cook on high for 30 minutes then turn down to low for additional 5 1/2 hours. When finished scoop out 1 cup of the vegetables out and puree and then add it back to the crock pot or eat as is. Note: optional to top off the soup with 2 tbsp light sour cream mixed with 1/8 tsp of cilantro. Makes three 1 1/2 cup servings. 229 members have added this recipe to their cookbook. Very tasty. I did not do this in the crockpot and it was still filling and full of flavor. 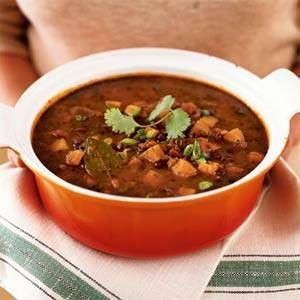 There are 274 calories in 1 serving of Spicy Black Bean Sweet Potato Soup. Calorie break-down: 21% fat, 67% carbs, 12% protein.